People of the Peyote expores the culture of the Huichol Indians of Mexico. The Huichols are best known outside Mexico for their worship of the peyote cactus. Ritually harvested each year, the peyote flower is pivotal to most Huichol observances of the annual ceremonial round. 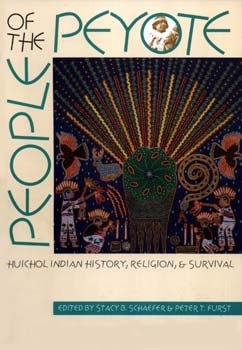 Authored by an international array of scholars including Huichol Indians, contributions to this volume analyze Huichol ethnography, ethnohistory, shamanism, religion, mythology, art, ethnobotany, society, and other topics. Stacy B. Schaefer is an associate professor of anthropology at the University of Texas, Pan American, in Edinburg, Texas. Peter T. Furst is professor emeritus in anthropology at the State University of New York, Albany, and is a research associate at the University of Pennsylvania Museum of Archaeology and Anthropology and the Museum of New Mexico.